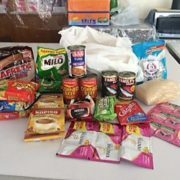 If you are looking to give your sponsored family a practical gift, a food package is the way to go. There are food packages available for $10, $15, and $20. Each food package has rice, noodles, meat ($10 canned, $15+ fresh), sugar, and other goodies. A food package is a great way to supplement sponsorship with a special treat your family will love. You can set up gifts for food packages to be sent monthly, quarterly, or just for special events like birthdays and holidays. Please note that if you send monthly food packages, you will receive quarterly thank you letters, but know that your sponsored family is grateful every time you think of them in your giving! Many sponsors enquire about the possibility of having their sponsored child’s house repaired for problems such as leaking roof, damage to walls, no comfort room (bathroom), or no electricity. The answer is YES! The repairs needed are reported on the Child Annual Progress Report (CAPR) that you receive as a sponsor, but in order for LCP to make repairs, it has to be requested by the sponsor. An LCP representative will visit your child’s home to evaluate the issue before any plans are made. You may set a budget prior to this process or once the issues have been surveyed. The LCP sponsorship office will coordinate the repairs and ensure they are completed within budget and in a timely manner. As a ministry, LCW takes pride in helping you communicate with your child. We encourage you to send letters through mail or email. A letter sent through the postal service can take up to 3 months for a reply and an email will take up to one month to receive a reply. You can email your child at littlechildrenofthephilippines@gmail.com. The LCP staff will print your email, deliver it to your child when they come to LCP, and send the scanned letter response as quickly as possible. You can send your letters through the mail to Little Children of the Philippines, Claytown, Daro, Dumaguete City, Philippines 6200. Always remember direct communication is prohibited through social media, email, or any other medium until the sponsored child is 18 years old for your protection, as well as the child’s. LCP works hard to help you build a relationship with your child through correspondence and look forward to helping you communicate.